We designed the entire project in Fusion 360. It was an adventure at some points but overall it wasn't too bad. Just time consuming. We started with the center eye. The plan was to 3d print the entire center and hollow it out for the LEDs. The original idea was to create 2 shells. One opaque and one translucent. We printed most of it from natural PLA which is great for diffusing light. The eye was created with a quadball form that was created in the modeling workspace. We then created a second eye that was a few mm larger than the original. The idea was to create the outer shell and embed it into the original eye and print them. Being a 3D printer noob at this point I wasn't really designing with printing in mind and just trying to get the shapes I wanted. We then cut the parts that we wanted to be lit with the LEDs from the outer shell. The outer eye was shelled and recessed into the inner eye a few millimeters. This turned out to be a bad idea. It worked but didn't give the best finish. So many parts needed to be sliced up for printing and just general tolerance issue that it should have been printed in larger chunks. One of the stipulations we put on ourselves when slicing was to have limited or no support structure. Greg would be printing them and we wanted to make sure every part came out good on a single try. We didn't have experience with or access to the slicer at all. Later projects have taught me to be a bit more clever in the design phase so that you get successful prints but also parts that fit together. The next phase of the design was also rather tricky. The front petals proved to be a challenge. The file is still kind of a mess with some smaller errors that I just couldn't remove. This part should have probably been done in the original outer shell design but we got it to work eventually. The rear protrusions proved to be a bit less challenging but still annoying in their own ways. Oh and did I mention all those red spikes need to be removable? At this point we could move on to the front spike details. This took a bit to figure out. The lightsaber blade we would be using for the top of the weapon had to go through this as well as the wings. Took some clever cutting to get the center to look right. 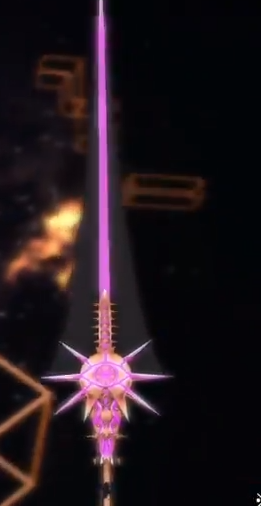 All in all this is my favorite part of the weapon even if the spikes are stupid sharp and have cut me more then once. In the beginning, I envisioned having to access the center of the eye for batteries and switches so we tried to design the top parts so they could come off and be magnetized in. This didn't work. The parts are too thin and the tolerances too tight. In face, we had to cut the slots open to get them in. This was mostly due to how many pieces the tops of the inner eye shell ended up being for printing. It's 12 inches in diameter so it had to be split up a bunch. Making it even more complicated by requiring no supports. We ended up gluing them all in but one and moving the batteries and switches to the PVC pipe in the core of the weapon. It was a rough design and had some VERY frustrating parts. It generated over 50 individual print files and the design file is a mess that's not even worth a screenshot at this point. We decided early on the best way to do the upper portion of the blade was sintra wings and a lightsaber blade. I kinda wanted to try some fabric wings with boning but it might not have looked right and would have involved that oh so evil of tasks... sewing. The blade was purchased from Ultrasabers. We ordered a grab bag saber. Originally it was thought to be cheaper than ordering individual components but we ended up swapping out the batteries for Lithium Ions anyway. We sent the files out to Greg to start the 80+ hours of printing that we needed. In the meantime we started working on the center beam of the weapon. We used a 1" PVC pipe. The design called for some small ring details along the length of the haft. We made these with a PVC pipe cutter. It worked great for creating perfect even rings. Also adds a bit of a ridge to the plastic. Next we needed a connection for the PVC pipe. Turns out a 1" treaded to slip coupler fits a 1" lightsaber blade.. well almost. We went in with a 1" forstner bit and the drill press to shave about 1/16" off the inside. This provided a good friction fit. We then drilled a hole in the side of the threads and tapped that to add a set screw. This will make sure the blade doesn't fall out. Later when we started mounting the electronics we also went in from the other end and drill in about 1/4" or so. The lightsaber LED module was also exactly 1 inch. So its just friction fit into the back of the coupler. Before we sent the finalized STLs to Greg we did a test with the PVC pipe. We cut blades and two central eyes from cardboard. We scaled the weapon down from almost 9 feet to around 7 and that made the central eye about 9 inches in diameter. This was another major hiccup with the design phase. We decided that the 12 inch eye looked better and had to go in and scale it up. It was another reason the design file is a mess. We worked out how to connect the pieces together in the design phase so we went ahead and added a threaded coupler to the end of the pipe and hit it with a plastic primer. These take about a week to fully cure usually. In hindsight we have a lot of trouble with paint sticking to them so we should have given it another coat. It had been kicking around the shop for weeks so a good cleaning and another coat of primer would have saved us a bit of a headache. At this point we started getting parts back from Greg so we started the fun part of sanding and painting them. Basically the gold parts received a few hits with 120 and 220 grit sandpaper and a good coat of filler primer. Some of the parts needed a coat of XTC-3D because they had really annoying joints and blemishes that couldn't be sanded out. The gold was done with the airbrush and createx paints. Might have been a better idea to rattlecan these as we got some parts that didn't get as many coats and looked a bit different and uneven. We did a few light tests with the front spike. This worked better than we hoped for. The lightsaber blade transfers light into the spike very well. There is a small problem with a seam in the middle. Its actually 4 pieces but only one shows in the transparent part. We coated the inside that needed to glow in XTC as well. It glows nice and even and looks great but you can see the seam. If I have to do something similar again then I'll be experimenting with printing the part without top or bottom layers where they meet. This should allow for a more seamless connection. The problem is there is more plastic in those areas as the printer lays down 2 solid layers each to seal the part. This rear spike has the threaded coupler permanently attached to it. When the central shaft is inserted it screws into this part and it works rather nicely. We did a short video of the process before we started sealing up the central eye. At this point we started the electronics portion of the build. This was another problem area. In hindsight I should have gone with 5 volt LED strips instead of 12 volts. It was really a matter of using what's in the shop and not engaging my brain. The old electrical engineering degree is rather rusty! The strips are laid out on the top and bottom of the inner eyes center plates. I drilled a via through plate so that both top and bottom are connected. We eventually ran a connection across the gap but the eye needed to be connected before that could happen. Sealing up the eye was a major problem. It was a point of no return but also needed to stabilize the prop so I could move forward with it. I couldn't solder connections inside the eye once it was sealed but we needed a connection to go through to the rear and connect to the PVC pipe. I was also struggling with how stable the build would be. The inner plates that the LEDs are on has no support other than the top and bottom eye layers. I tried to put a piece of acrylic tubing in there that the shaft could pass through but it was just a mess. Cutting the PLA wasn't fun either. In the end we glued down one side of the eye and soldered some short connection wires to the open side. These could be fished through holes in the outer shell and connected to the connectors we would be using. I wanted them directly connected to the eye but it wasn't possible. We also made another critical mistake here. I bridged the gap between the two sets of LED strips and after assembly it was obvious this was a big mistake. Every time you run the haft through the eye it caught on the wires. So some interesting surgery later and I was able to string it up and over the gap. The wires were attached to the top of the eye under a plate. They are not out of the way and can't be snagged or cast shadows on the parts that glow. Seriously it was a nightmare sticking a hot soldering iron into a small gap trying to desolder a joint. It was the worst game of Operation ever... If the iron touched the side of the eye it wasn't an annoying noise it was a permanent burn mark on the outside of the weapon. The good news was that after this nightmare we could rig up the weapon for the first time to see it how it all fit together. Before I move onto the electronics in the PVC pipe, I should talk about how we cut the blades. We pulled the profile from fusion and moved it into sketchup to create thin pieces that when connected made up the profile of the blade. We cut those from scrap MDF in the laser. The Sintra still had its protective coating on it so we used spray adhesive to connect the profile to the part and cut it by hand with a knife. I would have loved to use my bandsaw but it doesn't have a large enough throat for this job. Since I'm being very transparent on this project and its many problems... We had to cut these 3 times to get them right. It was my first time working with Sintra and I'm not a big fan. It can't be laser cut and it's a bit too soft for my tastes. Now don't get me wrong! Its an amazing material! People do fantastic stuff with it. Jo at Eitanya Designs has made some stuff that is just amazing. I'll keep playing with it but for now I'm going to stick to MDF and Styrene mostly. So this was another interesting hiccup. I should have put more thought into the battery and LED system before hand but like I mentioned earlier I just assumed it would work for some reason. I had lithium ions batteries ready to go into the system. The same ones most lightsabers have. We bought a charger and some holders for 2 batteries. The problem was I had no place to put the batteries. Originally they were supposed to go inside the eye but that plan changed. So we ended up with 2 singles connected in series. We used a piece of acrylic to hold them together. Of course I didn't have the specs for the lightsaber led and didn't consider the fact that I'd need to regulate its voltage. Combined the batteries put out around 8-9 Vdc. I should be closer to 12 for the LED strips but the larger LED started smoking when we connected it to the higher voltage. So I was trapped in a cycle of keep ordering parts and sink more time and money into a project that's already over time and over budget or find another solution. The best option would have been some voltage regulators to create the correct voltages and regulate them. However, we tapped the first battery and connected it to the larger LED and then tapped both batteries and sent them to the led strip. This worked. Not ideal but it worked. We did go back through before packing the project up and resoldered all the connections. I found my package of marine heat shrink tubing. It got misplaced in the recent shop move. This stuff is great for projects that need to last a while and could take a beating. It seals it from water and has an adhesive that normal heat shrink doesn't. The result is a stronger hold than just the solder alone. Now we are finally in the home stretch! We finished up the paint job on the plates and made sure everything was glued in place. Its so big we had to lean it up against the door of the shop to take a picture. The shop is a converted porch so the ceilings are not very tall. We added the spikes to the wings. These are just 3D printed and then we added magnets so it would hold everything in place. The top of the wings needed to be held onto the lightsaber blade somehow. I had considered drilling the polycarb and inserting a press fit brass threaded insert. I didn't want to risk the blade cracking on me so we formed some PETG over the top and used two black chicago screws to hold the blades together. All told it was a frustrating project that was very time consuming and a good example of doing your homework before you quote a job. However, I'm happy with how the weapon came out and look forward to doing more large complex weapons like this in the future. Oh and did I mention it weighs 6 pounds 3 ounces and it completely breaks down for transport? We will be working on a few more items for this character as well but they will be a lot less complex so keep an eye on our social media for more when that project gets started.